Know anyone who claims to dislike Brussels sprouts? Try serving this creamy, cheesy au gratin-style recipe—then watch the conversion to fandom! Preheat oven to 350°F. Cook Brussels sprouts in boiling salted water 6 min. or until tender. Meanwhile, melt butter in large saucepan on medium heat. Stir in flour with wire whisk. Gradually add milk, stirring until well blended after each addition. Bring to boil, stirring constantly. Reduce heat to low; simmer 3 to 5 min. or until thickened, stirring constantly. Remove from heat. Stir in cheese and nutmeg. Drain Brussels sprouts. Add to cheese sauce; mix lightly. Spoon into greased 13x9-inch baking dish; sprinkle with cracker crumbs. Bake 35 to 40 min. or until top is golden brown. 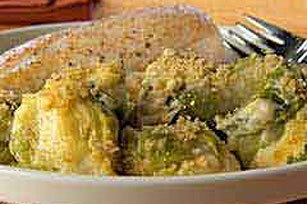 Enjoy this vegetable side dish at your next fall or winter get-together with your favorite cooked lean meat. Prepare as directed, using low-fat milk and KRAFT Shredded Fat Free Cheddar Cheese.